With a degree in English, two in theatre and a background in corporate training, instructional design and community management, Ms. Candy Blog has worked for such brands as Google/YouTube, Yahoo!, J.P. Morgan and American Express. She has also taught ages 3 and up in middle school, high school and universities in English, film, theater, journalism, and public speaking. 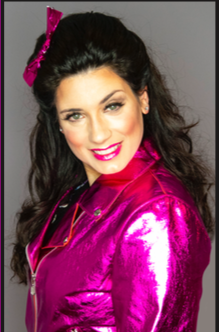 As a candy persona, she has appeared on NBC & FOX, partnering with such top brands as Hershey’s, Lindt, HSN, Epix, It’Sugar, Sour Patch Kids, Sugarpova, Just Born (Peeps/Mike & Ike), Jelly Belly, Torie & Howard, Adams & Brooks (Whirly Pop) and Dorval Trading Company (Sour Power) and has been named to FeedSpot’s Top 25 Candy Websites for Candy Lovers, becoming the #1 female candy website. As a speaker and educator, Ms. Candy Blog has spoken at Summit Live (San Francisco), Digital. (Vancouver), Cake Pop Con (Philadelphia), TedX Navesink (New Jersey), Midwest Digital Marketing Conference 17 (St. Louis), Social Media Camp (Victoria, BC), Blog Her 17 (Orlando), PR Daily (Virtual Summit) and Wedding MBA (Las Vegas). She has served as a judge for Cake Pop Con and Werrk.com. With a World of Wonder and two time Taste Award nominated YouTube channel, Ms. Candy Blog is the first candy livestreamer and a #1 female livestreaming expert according to Klout. She was awarded a contract with Periscope’s first talent network, Lifestream Productions, and placed on 3 top Periscoper lists after her first week on the live streaming platform. Ms. Candy Blog has been featured on Live.Me, Pocket Live, GhostCodes & MeVee, and has trended on Periscope & Hype. Her first published piece, “Sweet from Sour: Saved by a Supermodel”, is part of the best selling book “Open Your Gifts”, and received its debut at TedX Navesink. Inspired by her longtime role model, RuPaul, Ms. Candy Blog is the founder of Baby Drag Artists, a creative collective celebrating and promoting the global, under 21 drag community through various multi-media ventures. She started Nail Gloves by Candy in response to the needs of young drag artists, the company recently accepted to HSN's American Dreams Academy.